was born. Some of the recordings feature musicians who later went on to prominence on the world scene such as Rick Morrison from the Masters Apprentices who appears on the track I’m Going Back by Machine Gun Kelly’s Rejects (which he doesn’t remember recording!). While many of the tracks are bursting with talent and are drenched in the prevailing musical flavor of the time, none of the names have really been distilled into an archetype of state pride or stored in the collective archives of our psyche. Many of the tracks were recorded at Nationwide Studios which stood next to where the Worldsend hotel is on Hindley st. which was the tracking booth of choice for Adelaide's beat musicians throughout the late 60’s and early 70’s.Infact Nationwide was so good at producing records that master tapes from Melbourne, Brisbane & Tasmania were sent here for pressing! The studio building is now demolished, however Nick managed to find and transfer a number of the recordings to digital from the original acetate or reel to reel tapes which has manifested as the Big Beat Cellar Scene CD. "make people aware of the talent that we had that was probably neglected back in the day, alot of people don't realise the talent that we had." He has also unlocked a treasure trove of posters, photographs, memorabilia & magazines pending release which document that era of Adelaide's music history. Including a collection of the early days of arguably Adelaide’s most famous band the Masters Apprentices. Keep an eye on Nickoff records for future releases, including Big Beat Cellar Scene II which is due for release later this year. The record evokes an era of bustling scenesters furrowing around town on their way to a happening and carefree beatnicks cruising old cars through the Adelaide hills with a guitar in the back. Then, as now people would gather in town to socialise and bring themselves together into the scene. Although those days town looked very different. 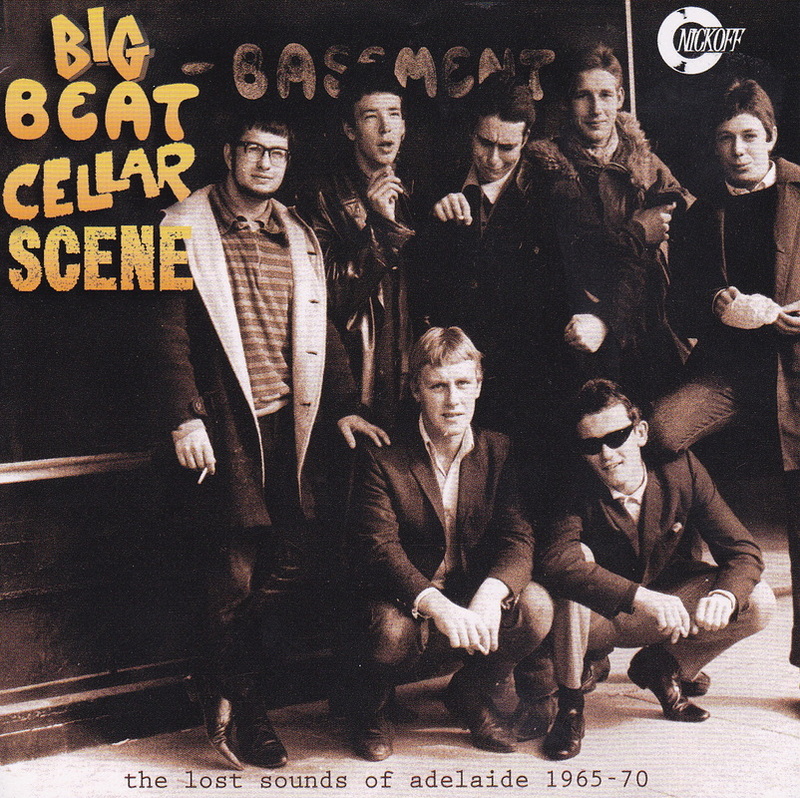 In a time when a pack of cigarettes cost 10 cents, the main hang outs in Adelaide during the 60's were the Cellar, beneath what is now the Jade Monkey, the Beat Basement on Rundle St. now SIC, the 20+ club on Grote st. (in the big red brick building now housing a Chinese grocery store), Big Daddy's in Gawler Place and the Railway Institute hall which was a dance hall attached to a public bath house behind the railway station on North terrace where the festival centre now stands. Poignantly the record conveys the hopes and dreams, love & search for life expressed musically by young kids which really has not changed over the years, just the form in which it is voiced. This is an important record to put Adelaide into a historical context. For to be a creative city we must be able to draw upon our roots and this cd is a big link to fill in the missing parts of the bigger picture for someone searching for the spirit of Adelaide. “During the mid sixties Adelaide had a thriving music scene. Disused inner city basements and cellars became dark, hot, noisy and smoky clubs and discos. Venues like Alan Hale’s Beat Basement, the Scene, Alex Innocenti’s the Cellar and Jim Popoff’s Big Daddy’s filled with teenagers to hear discs spun by local DJ’s and local groups pounding out R&B hits of the day. Bands like the Masters Apprentices, Blues Rags’n Hollers, Southern Gentlemen, Dust N’ Ashes, Blues Syndicate, The Vikings/Why 4, the Others, Sounds of Silence, the Bentbeaks, the Third Party, the Chosen few, the Harts, Syssys, The Hergs, D-coys, Inkase, James Taylor move, The Bucket, Five Sided Circle amongst many others in a thriving scene made their presence felt. Some were lucky enough to release one or maybe two 45’s at best, however the emergence of a number of independent recording facilities enabled many more to record demos and tracks to mime to on local tv music shows like Action or In time.